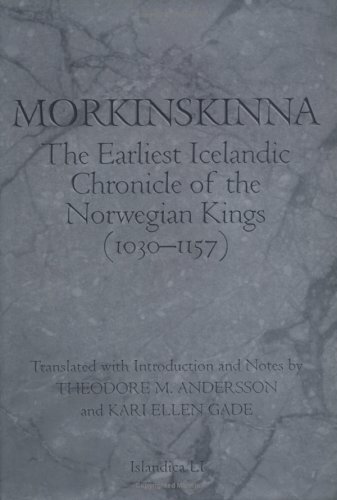 The Morkinskinna is an Icelandic Konungasögur (Kings Saga) that was written around 1220 and recounts the history of Norwegian royalty from the years 1025 to 1157 of the common era. Theodore M. Andersson explored the importance of this saga in his Growth of the Medieval Icelandic Saga by showing how Snorri Sturluson used the work as a source for his Heimskringla and how both works influenced the development of saga writing in Iceland. Alongside its value for literary studies, the Morkiskinna is essential reading for those interested in events in England in 1066. The Morkinskinna provides an alternate and older version of the life of Harald Hardrada and his fall at Stamford Bridge to the version given in the Heimskringla.The translation of the saga is by Theodore M. Andersson and Kari Gade, with Andersson handling the prose and Gade the verse sections. The translation is accompanied by an introduction and a handy selection of notes. An excellent first English translation of an important work.